Continuing with our theme of celebrating The Digit-al Dozen's 2nd Anniversary, today's theme is 'china'. China (i.e. dishes and fine tea cup sets) is the ~modern~ 2nd anniversary gift according to gift-giving traditions. 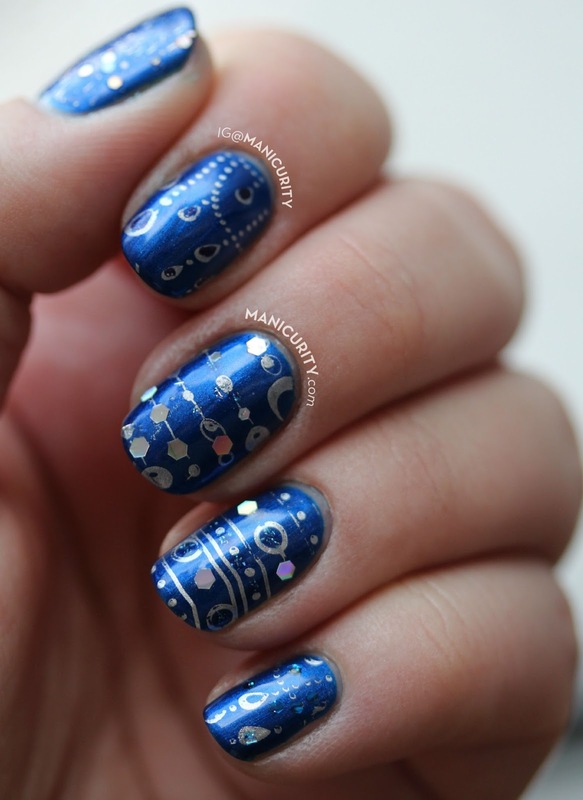 I haven't actually done a classic white and blue china-themed manicure yet so I was really excited for these! Check 'em out! For a limited time only, my hand-crafted creations will be featured at Kohl's department stores. Stop in the gift section and purchase these products for loved ones and take advantage of 30% off coupons at PassionatePennyPincher to help save! I've been asked by many of my followers to conduct an on-line seminar on how you can make these designs on your own. I did three coats of OPI My Vampire is Buff (yes, I finally bought this polish and can feel like a real nail blogger again now that it's in my possession) as a base coat. Then I used Sally Hansen Thinking of Blue for my main patterns as well as a tiny bit of grey and a tiny bit of gold to do some accents. I used a bunch of my small brushes to freehand this! Check out the other 'china' themed designs below! And of course don't forget to enter the MASSIVE international 51-prize giveaway! Click here to enter. Since September is the birth month of The Digit-al Dozen, it only makes sense to honor her (yep, totes calling The DD a her now) with some birthstone-inspired nails. For all of you beauties born in September, you have a pretty awesome birthstone in the form of sapphire. Today I was planning to do some freehand faceted sapphire gemstone nail art using Chalkboard Nail's totally fantastic tutorial (see her tutorial here) however Jacki over at Adventures in Acetone already did the same design for today and it looks so flawless (plus our nails are the same size/shape right now) SO I figured I should do something else. 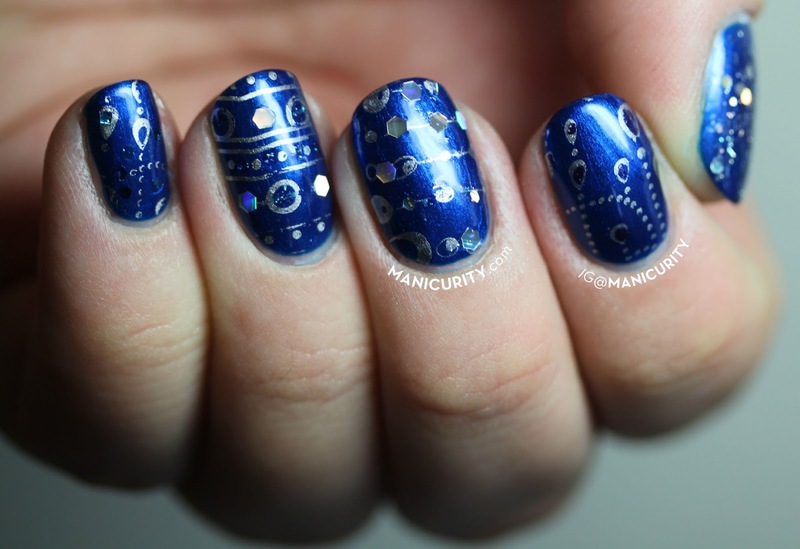 Now I have these jewelry-inspired stamping nails with some hand-placed glitter accents to show you! For this manicure I finally broke out some still-wrapped Pueen 24E Love Elements plates that I've had for an embarrassingly long time and stamped some jewelry-esque images onto my nails with silver foil. I'm not sure if my polish was drying too quickly, I'm too tired, or my plates are sort of meh but I felt like the images that were transferring were just so-so *giant frowny face*. I tried to salvage this design with some holo glitter to represent diamonds and sapphires, so hopefully that did the trick! My base color was Sinful Colors Midnight Blue, a slightly-blackened metallic blue polish. It took three coats for the coverage I liked, but it was easy and nice to paint with. 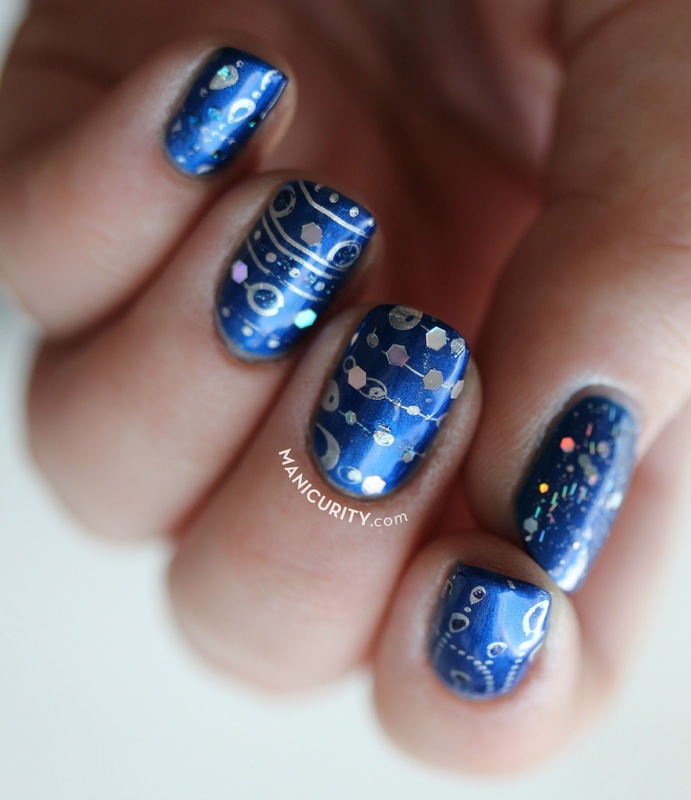 The silver polish I used to stamp with was Barry M Silver Foil and I used images from plates Pueen 31 and Pueen 26. Now check out the other sapphire designs below! Also don't forget to check out our super amazing massive celebration giveaway if you haven't yet! Click here to enter. Our second manicure theme is 'cotton' since the traditional two year anniversary gift is cotton!! My first thought was to do something inspired simply by cotton fabric since I could easily do another fun floral manicure, but instead I thought I would try a new-to-me technique and go for a whole quilt look! 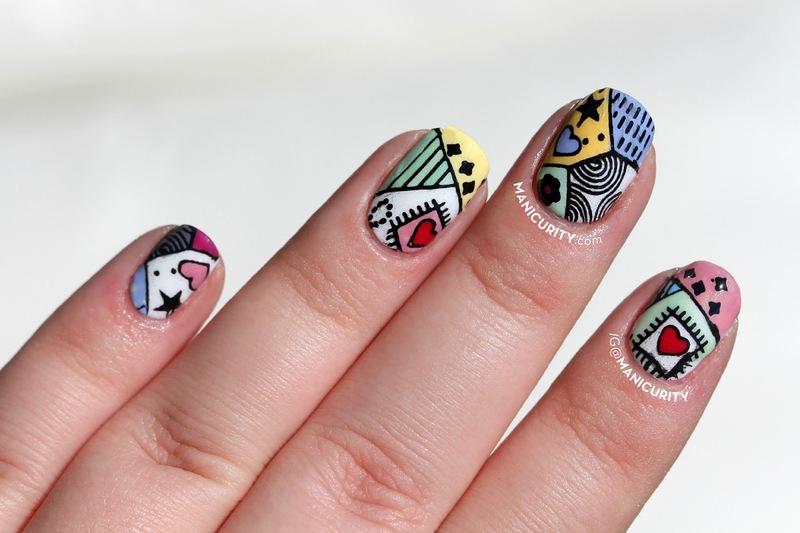 For this manicure I challenged myself to doing DIY stamping decals - basically making nail wraps out of a stamped image that you fill in with other colors. Check 'em out! 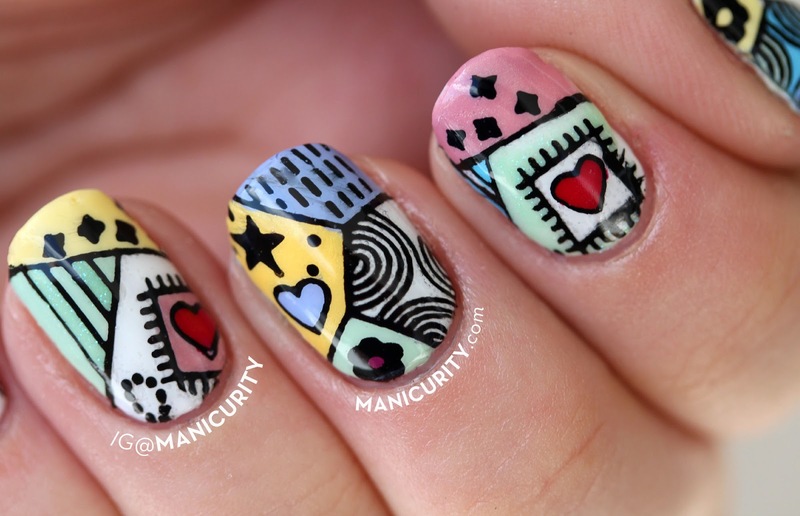 I used my most patchwork-quilt-esque stamping plate to do this design - the two quilt images from my Lilic A01 plate. To do these 'decals' I painted 5 rectangles of clear top coat onto a Ziploc sandwich bag and waited for them to dry. 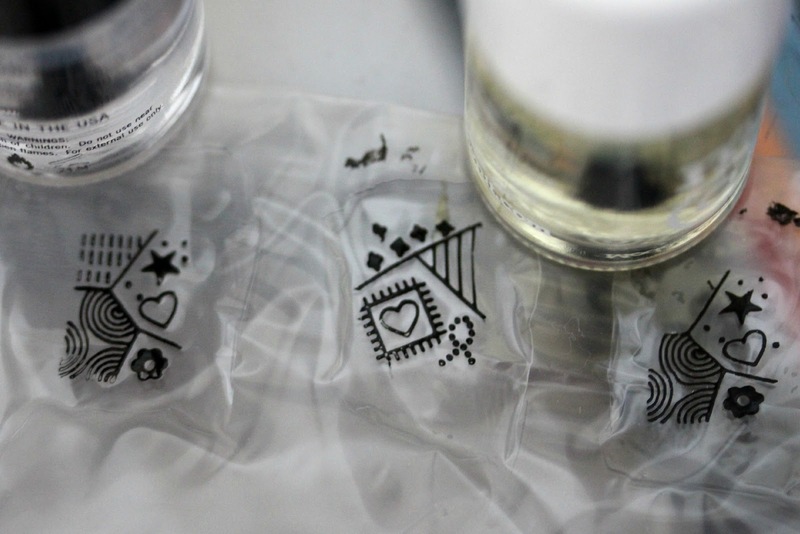 Then I stamped my images onto the center of each little rectangle of clear coat using a black polish. To place my decals I worked one nail at a time. I applied a non-quick-dry top coat to the nail, placed the decal, then topcoatted over the top of it to set it. Then I tried to gently removed the excess decal with an orange stick and manicure scissors. Any extra leftovers were removed with a brush and acetone since it's all made of dried nail polish! 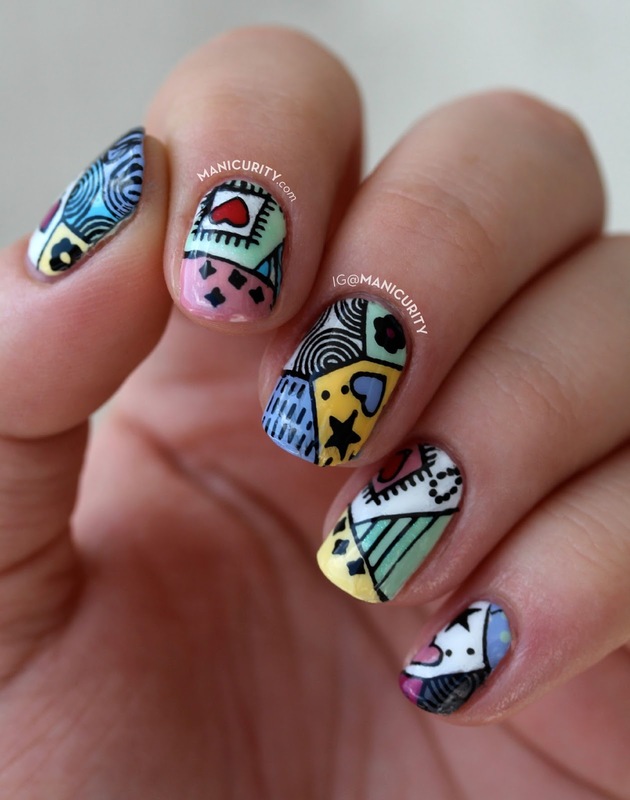 NOW don't forget to check out the other fab nail art below! The Digit-al Dozen 2nd Anniversary MASSIVE GIVEAWAY! The Digit-al Dozen has been kickin' for two full years already! I can barely believe it! And since it wouldn't be a very fun celebration without a MASSIVE FREAKIN' GIVEAWAY we have a pretty legendary one for y'all. To celebrate our two year anniversary, we're commemorating by working together with some amazing sponsors to offer you - our lovely, beautiful readers - 51 different amazing prizes. 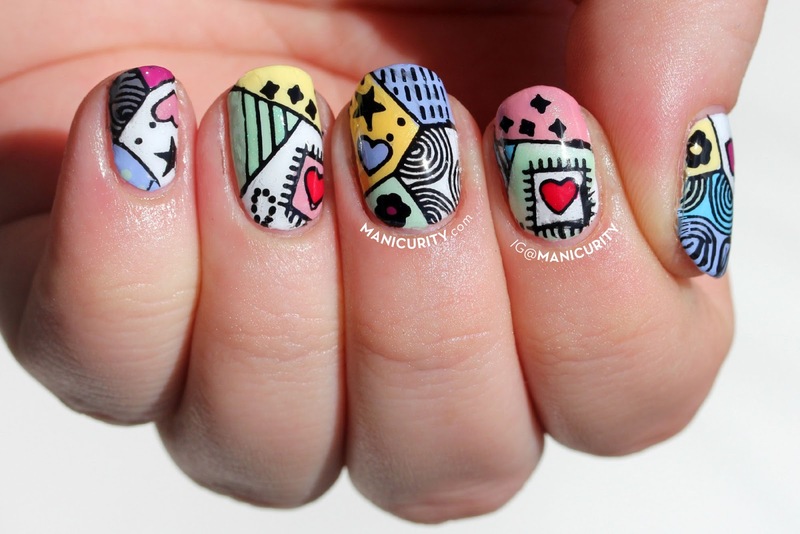 Manicurity© by Mannicure Blogger 2011-2017 | All photos are property of Emma Hoop regardless of where you find them on the internet (i.e. Google or weheartit). Please ask permission before 'borrowing' a photo. Thanks!